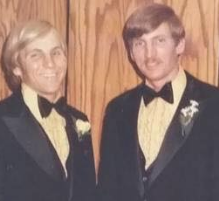 Stan DeFehr (left), my Dad's (right) younger brother, was a heart surgeon for the majority of his life, battling cancer but making priority to work on peoples’ hearts. Even though I didn’t spend too much time with him, being a couple states away, the time I did spend with him showed me that he wasn’t the kind of person to get together only to boast about the accomplishments of himself or his family. Instead, he showed an interest in others and genuinely cared about how and what they were doing. He was an encourager and focused on showing others that they mattered. You could tell his purpose in doing heart surgery was not only to work on people’s hearts physically, but also to minister to their hearts emotionally. I hope we can learn from such a practice, to not only focus on what we need to accomplish in doing our jobs well as to the Lord, but to also take up the call to minister to others through our jobs. Stan loved his patients and coworkers, ministering to them as he had the opportunity and fostering a family environment. We too have the opportunity to be ministers in our job environments, to simply show people that we care about them. The gospel isn’t just going up to someone, giving them a gospel tract, and briskly walking away. It’s an ongoing relationship with others in which they see the effect of the gospel on our lives, and want to get in on the same joy and love that they see coming out of our lives. As some of the earliest hymns (odes) of the church say, “Who is able to distinguish love, except him who is loved?” and, “The Lord is on my head like a crown, and I shall never be without Him. Plaited for me is the crown of truth, and it caused Your branches to blossom in me...For You live upon my head, and have blossomed upon me. Your fruits are full and complete; they are full of Your salvation.” With the fruit of the Spirit on display in our lives through our abiding relationship with Jesus, people not only hear the gospel from us, they experience and witness the effects of it (Galatians 5:22-23, John 15:1-17). May we too be like Uncle Stan, even as he imitated Christ, and take up the call to be pastoral heart surgeons for the sake of displaying the gospel to a world in desperate need of heart surgery (Ezekiel 36:26).